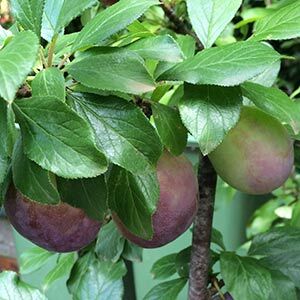 Plum trees are one of the easiest varieties of fruit tree to grow in the home garden. They are low care, require less pruning than most fruit trees and come in types that will fruit from early in the season to very late. In Australia Mariposa with its sweet juicy fruit and Ruby Blood which is a late bearing variety are very popular. Another factor that makes plum trees popular is the anti oxidant qualities of the fruit and it is the Japanese varieties that have this quality. Plum trees fall into two main categories, European types such as and Japanese types (blood plums). The most popular plum trees are red plums such as Satsuma, a red plum with red flesh. However plum tree varieties such as Santa Rosa, Mariposa, and Satsuma are all well known Japanese types. Angelina, Damson and Green Gage are some of the best know European varieties. Plums are also great for the home garden, not only for fresh fruit but also for making jams and preserving. Most plum trees need cross pollinators to fruit well (another plum tree of s different variety) although some such as Damson and Santa Rosa are self fertile to a degree. Generally speaking you will get larger crops on cross pollinated trees than self pollinators. Prunus domestica – This is the European plum. Prunus salicina – This is the Chinese plum. You will also find a number of dwarf varieties available, these are some of the well known varoeties grafted onto a dwarfing rootstock – look for the following names. It is worth noting that Plum trees fruit on one year old wood as well as older wood and fruiting spurs. It is really only the crossover branches that crowd the centre of the tree that need pruning.